Former Provost Milton Greenberg died on Aug. 27, according to a memo from University President Neil Kerwin. 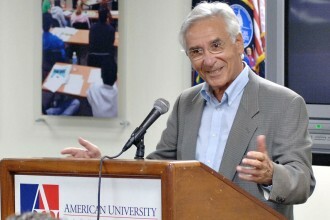 Greenberg served as provost from 1980 to 1993, according to Kerwin’s message to the AU community. Passionate about the practice of teaching and not just administration, Greenberg was also a professor in the School of Public Affairs and devoted much of his work to developing and rewarding high-quality faculty. Greenberg helped establish the Greenberg Ph.D. Seminars for Effective Teaching, which have touched many doctoral students at AU. He also created the yearly Milton and Sonia Greenberg Scholarship of Teaching and Learning Award, which recognizes faculty members who have contributed to the body of knowledge about teaching and creating curriculum. Greenberg was also an expert on the Servicemen’s Readjustment Act, also known as the “G.I. Bill,” which gave veterans across the country access to federal money to pay for higher education after it was passed in 1944. The former provost maintained a strong connection with the school even after his retirement, Kerwin wrote in his memo. From Western Michigan University News. A former Western Michigan University faculty member who was the first elected department chair at WMU and a nationally known political scientist and expert on the GI Bill died Aug. 27 in the Washington, D.C., area. Dr. Milton Greenberg, 88, professor and provost emeritus at American University, died after a brief illness. He was a WMU faculty member from 1955 to 1969. After leaving WMU, he went on to serve as dean of the College of Arts and Sciences at Illinois State University and as vice president for academic affairs at Roosevelt University before joining American University as provost in 1980. He later served as interim president at AU. During his time at WMU, Greenberg was a member of the political science faculty. In 1962, he and colleague Dr. Jack C. Plano published a major reference work, “The American Political Dictionary,” which became a staple in political science classrooms and eventually was published in 11 editions through 2002. Also during his time at WMU, Greenberg became the first departmental chairperson elected by the faculty to lead an academic department. Prior to that event in 1965, department heads were appointed by the administration. Greenberg also served as president of the WMU Faculty Senate. Before launching his academic career, Greenberg served during World War II as a paratrooper with the 82nd Airborne Division. Following the war and with the help of the GI Bill, he was able to earn his bachelor’s degree from Brooklyn College and master’s and doctoral degrees from the University of Wisconsin. In 2004, for the 60th anniversary of the GI Bill, Greenberg published an article in The Chronicle of Higher Education about “How the GI Bill Changed Higher Education.” After the June 2008 passage of the post-9/11 Veterans Educational Assistance Act, he was the author of another article for the Chronicle comparing the new and older versions of the historic legislation.